Asernal are worried about the fitness of Granit Xhaka ahead of Monday's Premier League clash against Newcastle. The 26 year-old suffered a set back during Switzerland's 3-3 draw with Denmark on Tuesday in the opening Group D Euro 2020 qualifer. 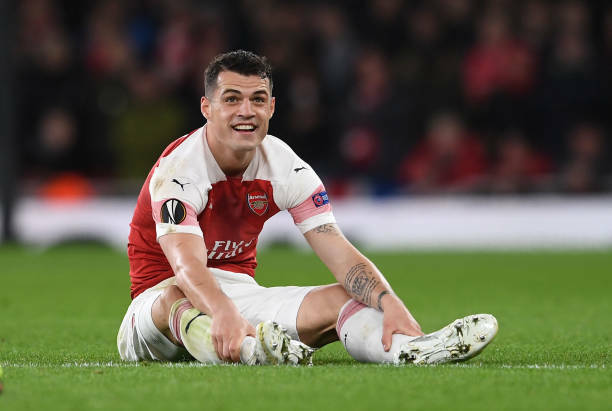 Xhaka had fired his side into 2-0 lead with a shocking strike from distance midway through the 2nd-half but was replaced with 11mins remaining. Vladimir Petkovic's sid subsequently conceded three goals in closing 6mins and forced to settle for a 3-3 draw. The former Borussia Monchengladbach midfielder has cemented his place in Unai Emery's side despite the summer arrivals of Matteo Guendouzi and Lucas Torreira Xhaka was deployed as the solitary defensive midfielder in the recent wins over Rennes and Man Utd with Emery opting for Uncharacteristic attacking line-ups, featuring Lacazette,Aubameyang,Ozil and Ramsey. Asernal are just one point behind third place Tottenham ahead of the resumption of Premier League this weekend and host a similarly resurgent Newcastle side at Emirate on Monday evening.